There’s hardly anybody who doesn’t know Scottish actor Iain Glen. If you don’t know him by his real name then you should at least know him by the name of his character in Resident Evil (Dr Alexander Isaacs/Tyrant) and in Game of Thrones as Ser Jorah Mormont. The film, TV and stage actor has also appeared in other popular movies like Mountains of the Moon where he played the role of Hanning Speke, in Downton Abbey as Sir Richard Carlisle and as Jarrod Slade in Cleverman. He also appeared as Jack Taylor in a TV series of the same name. Iain Glen was born in Edinburgh, Scotland on the 24th of June 1961. The names of his parents are not known. According to Glen, his parents are alive and live in Scotland, although they are now more fragile and less mobile than they used to be. Glen has an older brother Hamish Glen, a former artistic director of the Dundee Repertory Theatre, Scotland and the current artistic director of the Belgrade Theatre, Coventry, West Midlands, England. He attended Edinburgh Academy (an independent school for boys). After high school, he attended the University of Aberdeen briefly before dropping out to study at The Royal Academy of Dramatic Art (RADA) in London, where he won the Bancroft Gold Medal. According to the actor, he never discovered his acting skills until his days at the University Of Aberdeen and when he realised acting was something he derived joy in doing and would love to continue doing, he quickly dropped out from the university and with his parents’ love and blessings, he headed to RADA. He kicked off his career as a stage actor and later went into film and television acting. At the 40th Berlin International Film Festival in 1990, Iain Glen won the Silver Bear for Best Actor for his role in the biopic film Silent Scream. In that same year, he also won the Golden Lion Award at the Venice Film Festival for playing Hamlet, Prince of Denmark in the film adaptation of Tom Stoppard’s play Rosencrantz and Guildenstern are Dead. For his performance in The Blue Room opposite Nicole Kidman, he earned an Olivier Award nomination. In 2002, he played Carl Gustav Jung the Italian-French-British romance-drama film The Soul Keeper. In 2010, he began starring HBO series Game of Thrones as Ser Jorah Mormont. In the same year, he appeared as Father Octavian in some episodes of the 5th season of the revived TV series Doctor Who. He also played Sir Richard Carlisle in Downton Abbey. From 2010 to date, Glen has been playing the title character in the Irish TV crime series Jack Taylor which is an adaptation of Ben Bruen. In 2012, he was in the BBC drama series Prisoners’ Wives, as Francesca’s husband Paul, who was imprisoned for drug trafficking. In that same year, he starred in a new 4-part BBC Radio 4 adaptation of Sebastian Baczkiewicz’s The Count of Monte Cristo, and the following year, he played the lead in the new play Longing. Between December 2013 and January 2014, he starred in Fortune’s Fool at the Old Vic alongside Richard McCabe. His role was taken over by Patrick Cremin as he couldn’t continue due to health issues. In 2015, Glen did the voiceover for a Vauxhall Mokka Ad. Glen was married to English actress Susannah Harker from 1993 to 2004. After his divorce, he began dating Charlotte Emmerson in 2005, they dated for twelve years before finally tying the knots in the Summer of 2017. The actor has three children; one son with his first wife and two daughters with his current wife. The Scotish actor stands at the height of 6 ft 1 in (1.85 m). 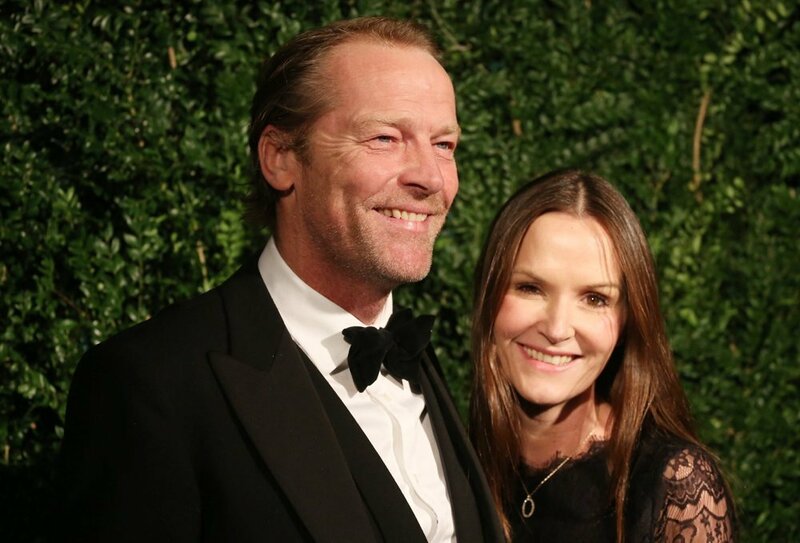 Iain Glen admits he is a foodie who would eat just about anything and get away with it and despite his love for food, the actor has managed to keep his body weight under check, weighing 80 kg. However, when it comes to making meals, Glen says he is really moronic and doesn’t have an instinct for it at all. The happiest moments of his life has been at the birth of his children. Given half the chance, Glen says he ‘ll be naked. He loves walking around his house naked until he is forced to put on his clothes and go out. He said the guitar keeps him sane and that he is addicted to cycling. His net worth is currently estimated at $3 million.